IMPCVALMAXIMIANVSPFAVG [IMP C VAL MAXIMIANVS P F AVG]; bust r., laur., cuir. MARTIPATRIPROPVGNATORI [MARTI PATRI PROPVGNATORI]; Mars, naked, advancing r., r. holding transverse spear, l. shield. PLC in exergue. UNLISTED FOR RULER. 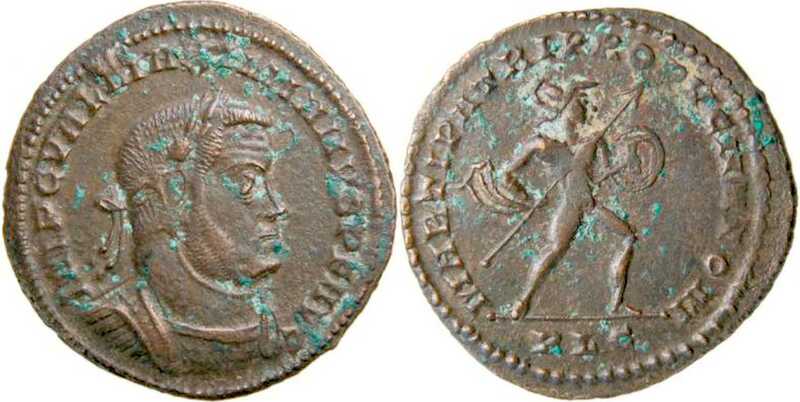 RIC lists this issue only for Constantine and Maximinus (p. 261). Noted in Bastien Lyon I, 480 (two examples). Coin should be listed before LUGDUNUM 260. Weight 6.51 g; diameter 27.77 mm. Ex Martin Griffiths; now in the Robert Bernobich Collection.